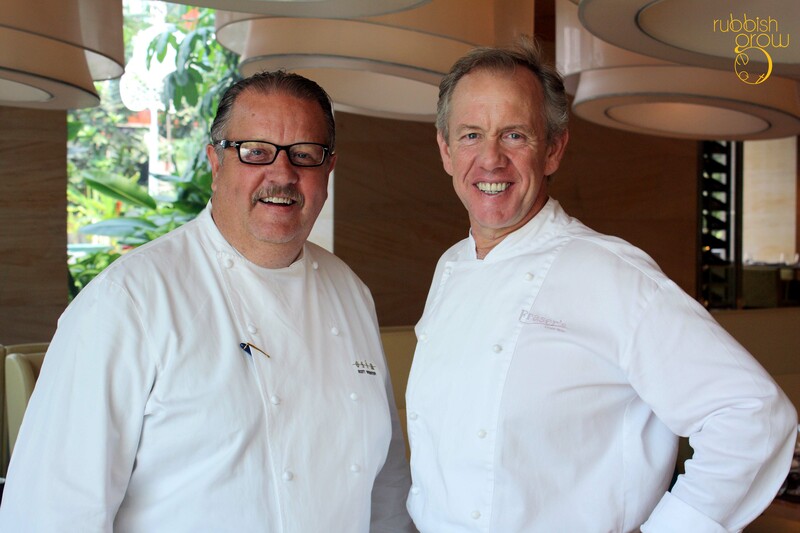 Celebrity chef Scott Webster (left) and his friend, Chris Taylor. 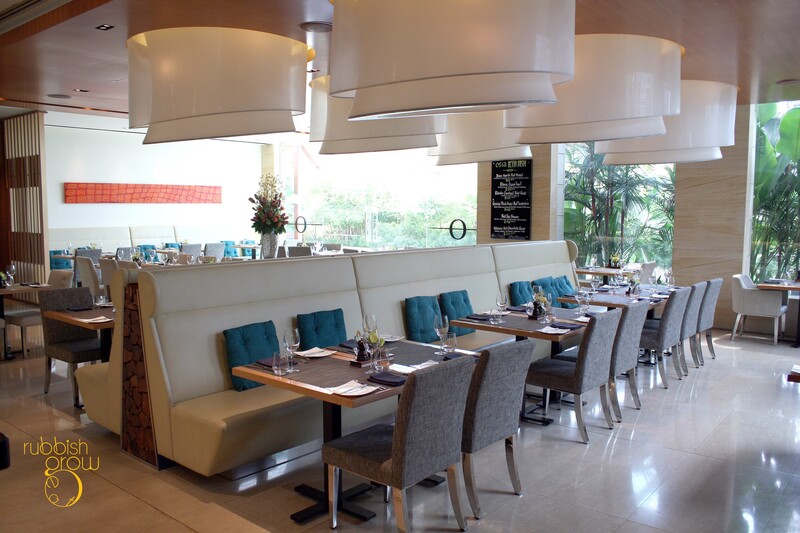 The first in the series of “Cooking with Friends,” celebrity chef Scott Webster brings in chef Chris Taylor of Fraser’s Restaurant in Perth to present special menus and masterclasses from 24-28 July only. 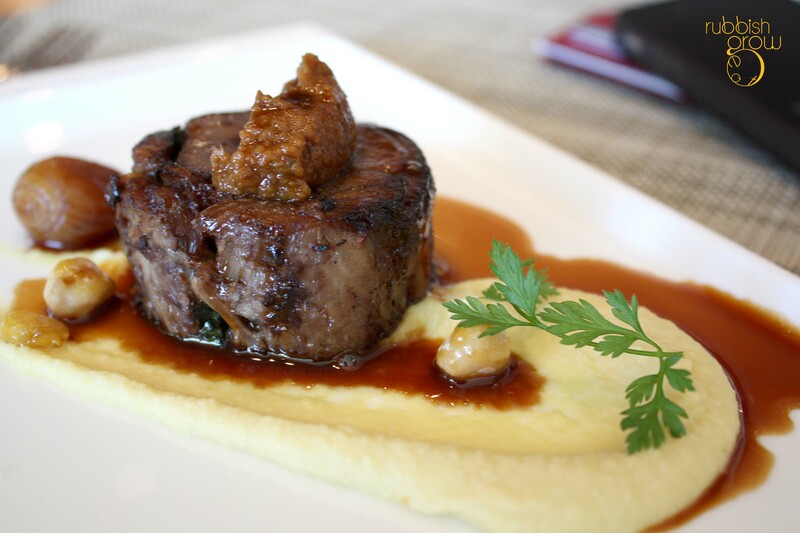 Chef Taylor’s philosophy is to serve clean, simple and produce-driven cuisine. “No fancy drops drops drops on the plate,” he quips. 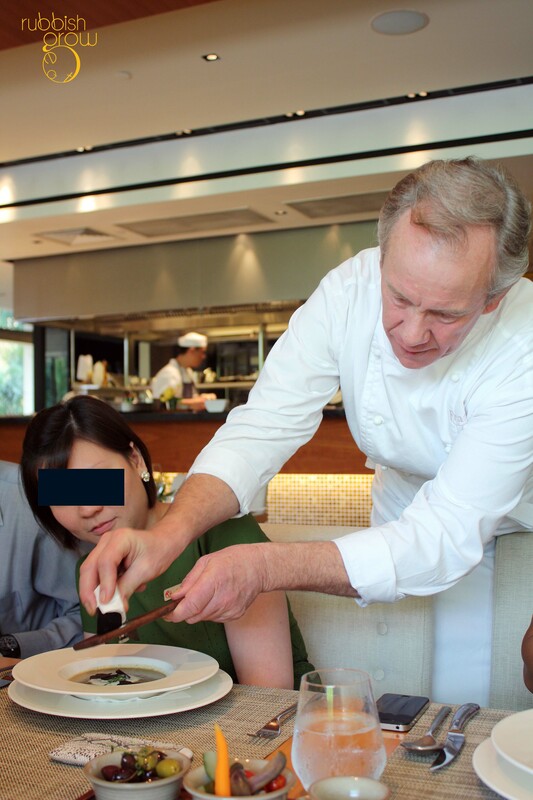 Chef Taylor has big shoes to fill for Osia Restaurant has been awarded maybe a million awards: Wine & Dine (3 stars), National Critic Choices 2012, Tatler’s Best Restaurants, Miele Guide, etc. 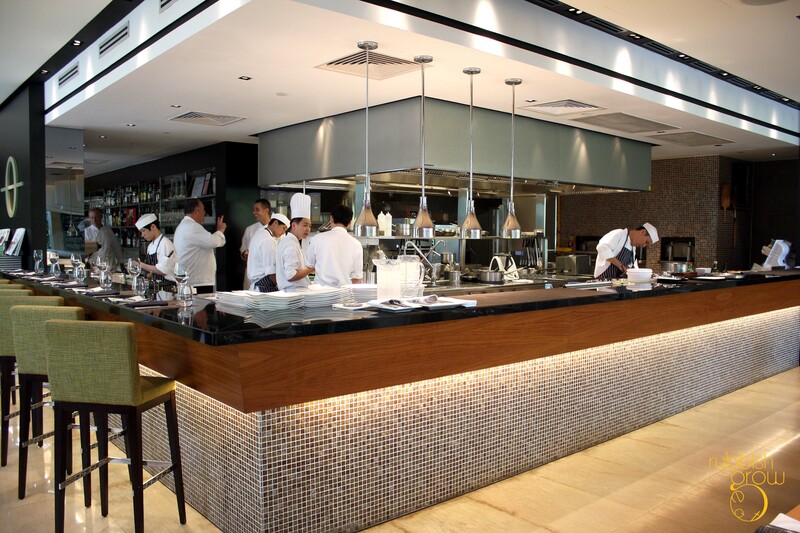 Chef Taylor’s 5-course lunch costs $78++, 7-course dinner $165++ and masterclasses(27 and 28 July only, 2.30-5.30pm) at $88++, teaching three courses, kingfish ceviche, braised lammed shoulder and apple and rhubarb crumble, followed by tasting portions. Call or email to make reservations (info at the end of the review). 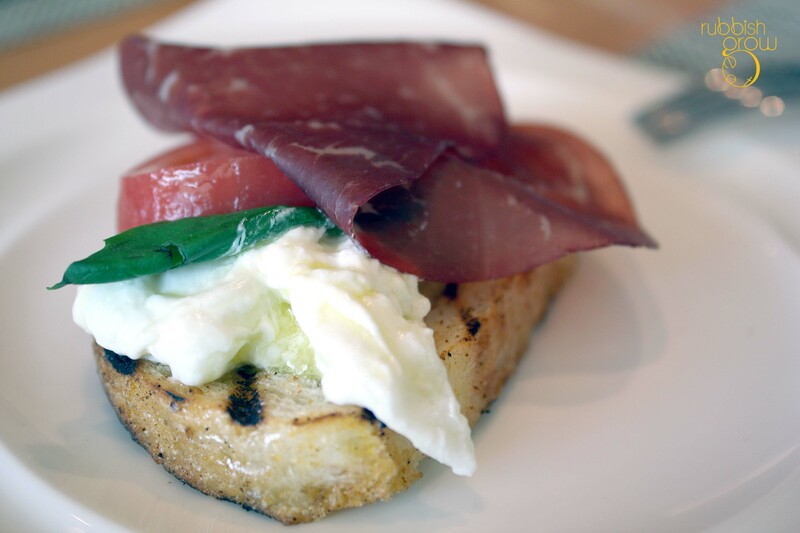 The appetizer is DIY ciabatta bread (with grilled lines, toasted to a crisp) topped with burrata cheese, a basil leaf, cured beef, heirloom tomato with olive oil. The result is a creamy, invigorating, and surprisingly complex open-faced sandwich. Its greasiness (a good kind of greasiness) from the toast is finger-licking good. 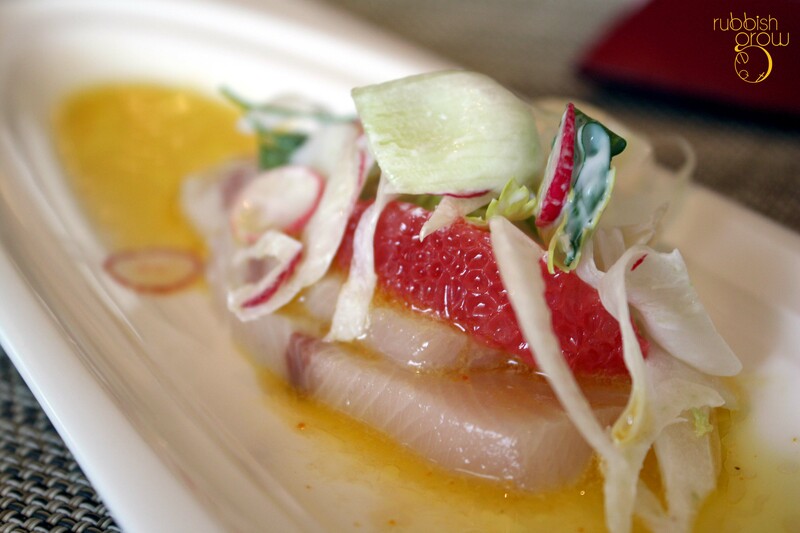 A very fresh yellow tail kingfish ceviche, sprinkled with lemon olive oil, with yellow celery leaves, radish, fennel, grape fruit, is a light, tangy dish–although those who prefer a heavier flavor may not find this palatable. TRUFFLES. 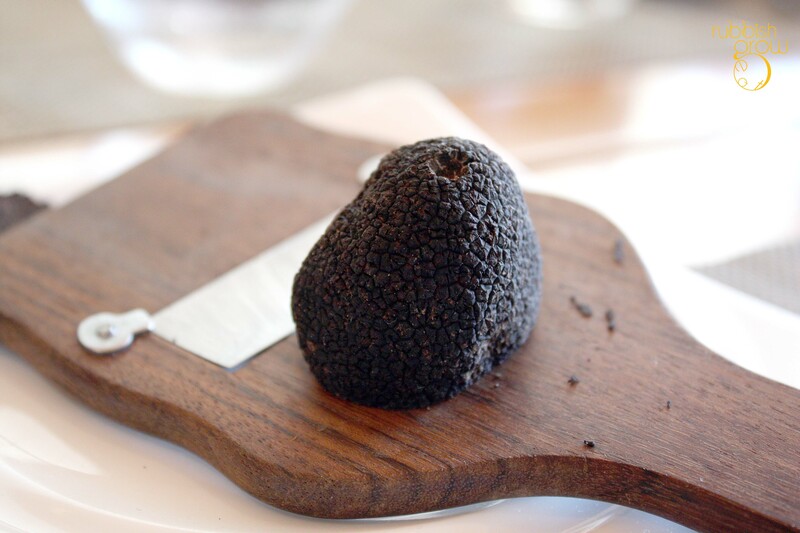 Truffles are in season! Indubitably, the dish of the day belongs to the porcini mushroom soup with basil, truffle cream and paper-thin Manjimup winter truffle that smells like champagne. A kg costs $2000! 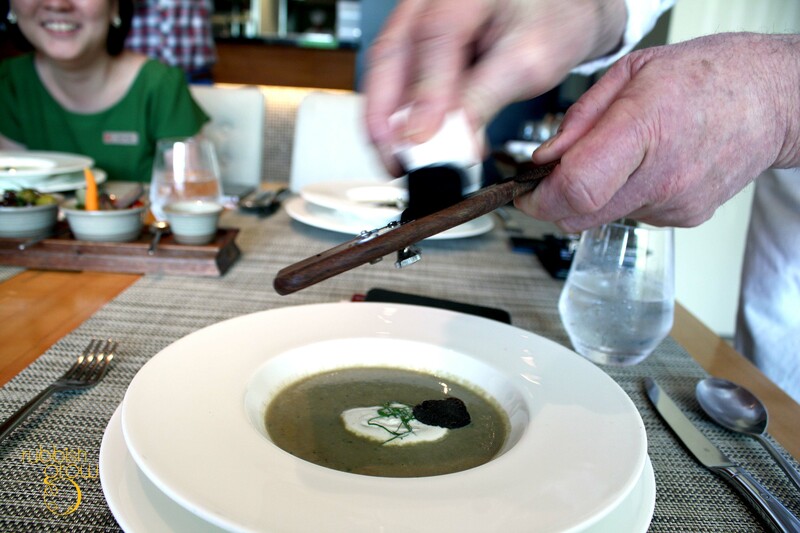 While I’d have preferred the mushroom soup to be more robust and muskier, the truffle really educes the fragrance and, surprisingly, the basil, almost chlorophyll-tasting, holds the the dish together. Yet, as a whole, this is a rather light dish, and one person would not feel jerlat (or glutted) upon finishing an entire bowl. Spiced with turmeric, ginger and garlic, the Indian-inspired sea bream sits on a sea of black dahl and is crowned with yogurt mint. 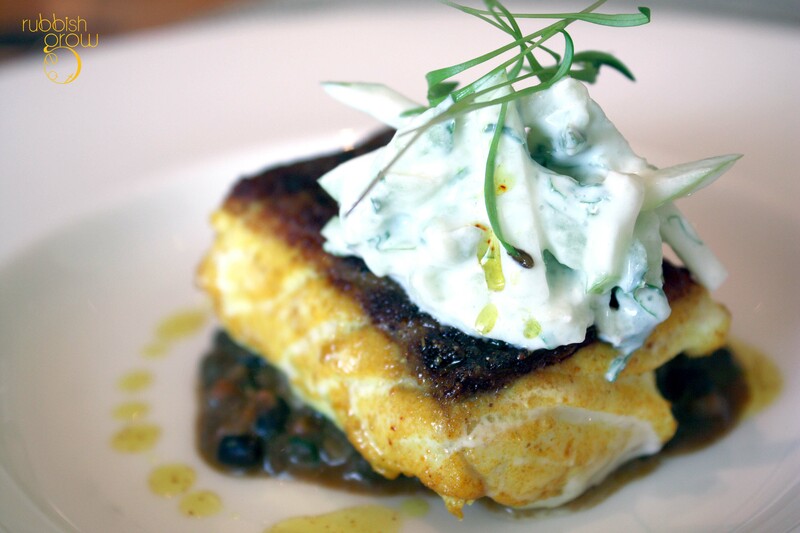 While, in theory, the ingredients complement each other, it is always difficult to present fish well because, unlike other meat, the flavors don’t penetrate the fish. As a result, the spices only coat the surface but couldn’t help to improve the bland taste of fish meat. It can also be unevenly cooked, with some parts very succulent and others, dry. 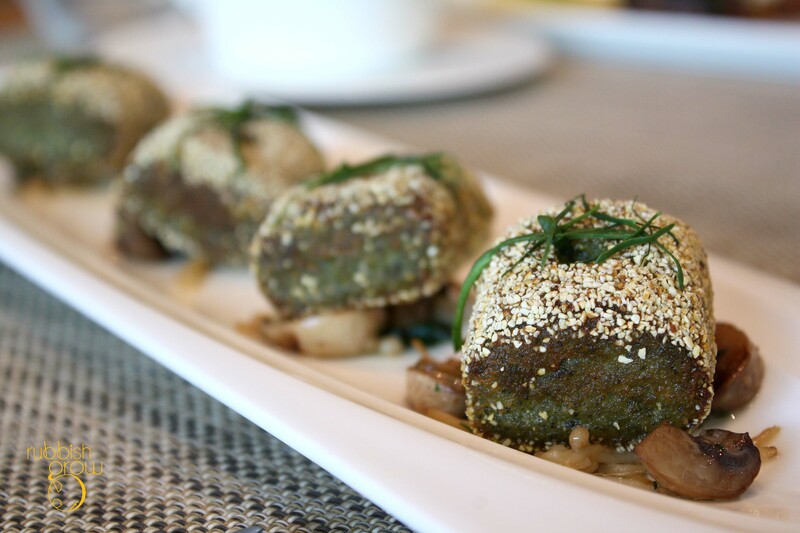 The dark olive-green color of the pan fried gnocchi comes from–not olives but–spinach and feta cheese. Coated with semolina, the gnocchi is crusty outside, mochi-like texture within, and tastes very creamy. A good way to cheat your progeny to eat greens. An exceptional and unique dish. The Middle-Eastern inspired slow-roasted lamb shoulder with hummus and walnut-pomergranate compote is extremely tender and slightly tangy although I’d like it to be slightly heavier in flavors. 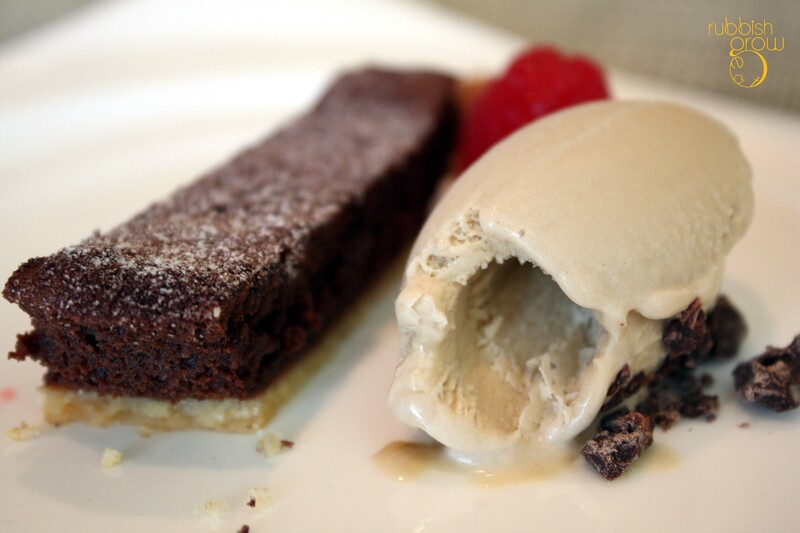 Paired with espresso ice cream, the Valrhona chocolate tart is amazing with the right balance of bitterness, cocoa and sweetness, that leaves you wanting for more and never feel surfeited. ps: Thank you, Tania, Wendy, Chefs Webster and Taylor, and Osia for the invite.